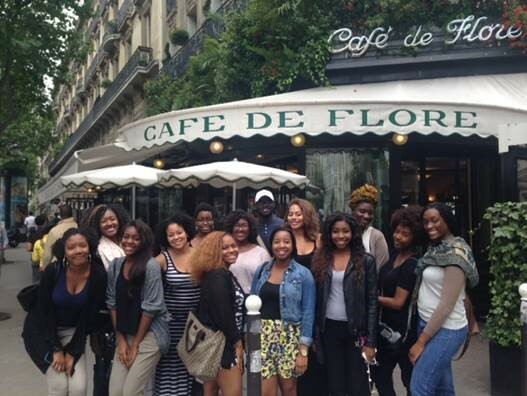 Students from a previous session of the Paris Noir program enjoy the sights of the city. Today, the College of Arts and Sciences and SU Abroad announced the reopening of the application period for one of the University’s most revered study abroad experiences—Paris Noir. The program, which began 14 years ago, is a six-credit opportunity aimed at students who are interested in learning about the influence and dynamics of black culture, literature and experience in Paris, both past and present. Nearly two weeks ago, it was announced that Paris Noir would not be offered this summer due to low enrollment. Like any other class, course or study abroad program with low enrollment in a given year, the University has to re-evaluate whether the program can still be offered. But College of Arts and Sciences Dean Karin Ruhlandt says the program has had such a tremendous impact on its participants, that reopening the application period is not only appropriate, but necessary. The College of Arts and Sciences, the SU Abroad team and the program’s faculty director, Associate Professor Janis Mayes, will collaborate on deploying vigorous recruitment efforts in hopes of attracting interested students. In order for the trip to go on as planned, 14 students must commit to the program. The deadline to apply is Friday, April 17; all deposits ($550) and Conditions of Participation forms must be in by Friday, April 24. Students are responsible for the cost of their airfare as well as most of their meals. Mayes, professor of African-American studies and creator of Paris Noir, says she is appreciative of Dean Ruhlandt, Chancellor Kent Syverud, Interim Provost Liz Liddy and the staff at SU Abroad for their support. Students interested in applying to Paris Noir should visit http://syr-sa.terradotta.com/index.cfm?FuseAction=Programs.ViewProgram&Program_ID=10182. If they have questions, they should contact Marie Kulikowsky by email at mkulikow@syr.edu. Contributions to support the Paris Noir program are welcome. To support the program, contact Karen Weiss Jones, assistant dean for advancement, at 315-443-2028 or kmweissj@syr.edu.